All of the silver jewelry is made entirely of sterling silver, from the clasps to the wire wrapping. Each is hand-crafted and each one is unique. 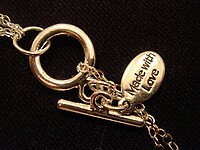 Each necklace, bracelet or anklet is kissed with a special "made with love" silver charm. 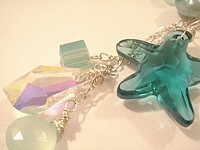 Some necklaces have a chain dangler in the back with the clasp that has another gem to accentuate the back of the neck. Here is a list of most of the semi-precious gemstones that I use to compose all of my unique designs. You are more than welcome to choose any gemstones from this list to custom design your own piece. Sizes ,cuts and pricing may vary depending on your request. Mother of Pearl (any color), Natural & Dark Carnelian, Black Onyx, Rose Quartz, Strawberry Quartz, Cherry Quartz, Sodalite, Turquoise Green Chalcedony, Blue Chalcedony, Citrine, Smoky Quartz, Labradorite, iolite, Tiger's Eye, Aventurine, Natural Green Amazonite, Natural New Jade, Ruby Red Quartz, Natural Clear Quartz, Coffee Quartz, Light Green Jade Quartz, Dark Green Quartz, Ivory, Peacock, Green, Chocolate, Peach, Turquoise Freshwater Pearl, Turquoise Blue Chalcedony, Amethyst, Dark Green Chalcedony, Yellow Chalcedony, Light Blue Quartz, Blue Quartz, Orange Quartz, Light Green Quartz, Green Turquoise, Yellow Turquoise, Pink Chalcedony, Natural or Manmade Turquoise, Fluorite, Blue Zircon, Blue Topaz, Peruvian Opal Quartz, White Opal, Topaz Quartz, Light Purple Quartz, Purple Grape Quartz, Mooka Jasper, Shells (any color), Millefiori Beads, Murano Beads, Swarovski Crystals, Agate, Jasper, Aquamarine, Garnet, Jade, Howlite, Olive Jade, Peridot, candy jade etc. 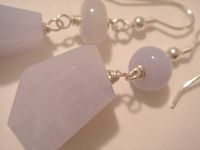 Each design can be custom ordered with any briolettes or gemstones mentioned on this page with any length , size and any number of briolettes. (prices subject to change to order) If you have another specific gemstone you'd like to include that you don't see, don't hesitate to ask!